The two other things I got at the Farmer's Market last Wednesday were Chinese broccoli (on the left) and flowering onion tops. I knew I wanted to make a stir fry so I had my eye out for some good greens. I have never seen flowering onion tops before, nor had I heard of them. So of course I had to get them. 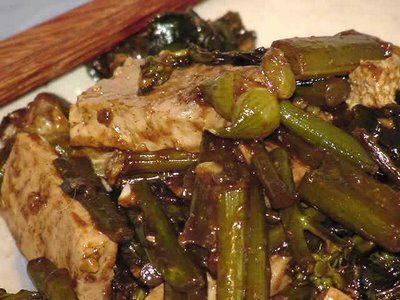 I had heard of Chinese broccoli before, but have never cooked with it. The onion tops look like the tops of green onions, but they have teeny tiny little onion bulb clusters at the top, I decided to keep the stir-fry simple and just used marinated tofu with the greens. Because green onions usually cook pretty fast, I decided to put the broccoli into the wok first. I should have paid more attention while I was cutting the onion tops, though. They were thicker than green onions, and the minute I put the broccoli into the wok I realized the onion tops were going to take longer to cook than the broccoli. I threw them in as soon as I realized my mistake, but I knew that I would have to overcook the broccoli if I wanted the onions to soften up. So I compromised, and the onions were a little too fibrous as a result. But that didn't take too much away from the taste. The onion greens may have been chewy, but the bulb clusters at the top were cooked just fine, and they popped with onion flavor when I bit down on them. Very tasty. You can see one of the cooked clusters at the top of the photo. I've described my stir-fry method, but I don't think I've provided an actual recipe. This is pretty much the standard marinade and sauce I use every time, but the other ingredients usually change from dish to dish. Combine the ingredients for the tofu marinade. Put a spoonful of marinade in the bottom of a flat dish and place tofu rectangles in a single layer. Pour the rest of the marinade over the tofu and set aside. To make the sauce, combine the broth and orange juice in a bowl. In another small bowl, combine the corn starch and water and stir. Chop the vegetables you are going to use, making sure that the pieces are all even. 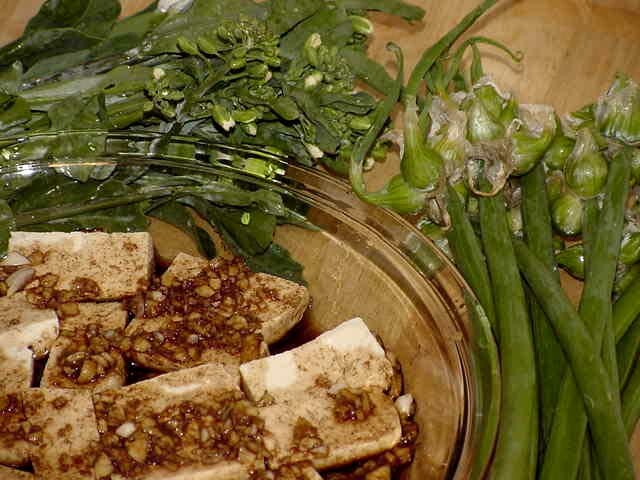 Make sure all ingredients, including tofu, are within reach before you start. Heat the wok, then add the oil. When oil starts smoking, add the vegetable that takes the longest to cook and stir fry for a minute or two, then add the next longest-cooking vegetable and cook for about a minute, then add the next vegetable (I wouldn't use more than 3 or 4 vegetables). When the last vegetable has been added and sauteed for 1 minute, lower the heat, cover the wok and steam for 7-10 minutes. (This may not be authentic but it works for me--otherwise the vegetables don't cook evenly.) Check after 5 minutes to make sure the vegetables don't overcook. When vegetables are ready, bring the wok back up to high heat. Drain the tofu marinade into the bowl with the sauce, then add the tofu and the sauce to the wok with the vegetables. Once the sauce is hot and boiling, add the corn starch slurry and stir until it thickens.